Congratulations to Jessica who won first prize in the competition organised by the Friends of Ashbeach School. 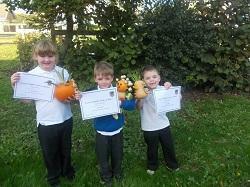 Freddie and Ryan were awarded second and third places respectively. Thank you to everyone who entered the competition, there were some very scary monsters.